In the span of a week, a devout group of researchers from Skoltech’s Hydrocarbon Recovery Center trudged dozens of kilometers through the sort of unforgiving terrain that can only exist on a remote, uninhabited island. They endured harsh winds and rain as they carved out the trail to their destination, passing through abandoned military facilities en route, all the while hoping they wouldn’t encounter any unexpected wildlife. But for this team or rugged researchers, the challenges of the trek were all worth it for the opportunity to experience the geographical anomaly that is Onekotan. Part of the Pacific Ring of Fire, the Kuril Islands emerged from the subduction of the Pacific Plate beneath the Okhotsk Plate. The subduction process generates magma, which in turn fuels the growth of volcanoes. 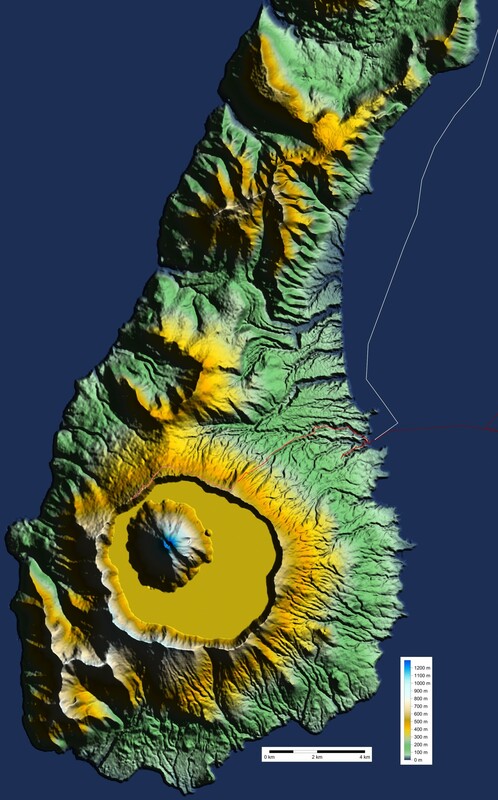 Of some 100 volcanos festooning the island chain, about 40 are active. Situated in the northern Kuril Islands, Onekotan bears a unique marking that has long attracted the interest of geologists and geographers alike: an active volcano situated within the caldera of a previously erupted volcano. The peak of the Krenitsyn – the active volcano – juts out of the Tao-Rusyr Caldera, which has filled with water in the millennia that have passed since its eruption, creating a ring-shaped lake unlike anything else on the planet. The Krenitsyn most recently erupted in 1952. It was this lake that captured the interest of the Skoltech team, inspiring them to undertake a weeklong surveying mission. The Skoltech team included: leading research scientist Andrey Kazak, senior research scientist Denis Sabitov, senior engineer Vladimir Stukachev, PhD student Victor Nachev and associate director for experimental research Alexey Cheremisin — all from Center for Hydrocarbon Recovery (CHR) CREI. In preparing for the trip, the team created a series of digital elevation models (top view; bird view). Upon their return, they would supplement these models with GPS tracking information that they collected during the journey with the aim of adding to the body of knowledge about the little-understood terrain of Onekotan. Beyond the scientific preparations, there was a litany of logistical issues to be resolved. Not having been permanently inhabited for more than a century, Onekotan lacks any semblance of a basic modern infrastructure. 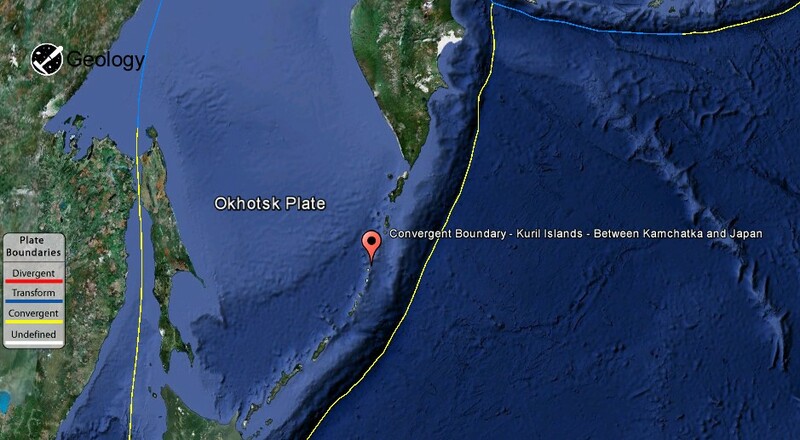 Accordingly, it was up to the Skoltech team to find their own way from Kamchatka to the distant island. In advance, they hired a boat and an experienced sea captain who would transport them from Kamchatka to the island. Upon arrival, they would get their first lesson in the critical importance of weather when it comes to traveling in the region. Storms at sea prevented them from leaving when they originally planned; they were marooned in Kamchatka for two days before they could set sail. 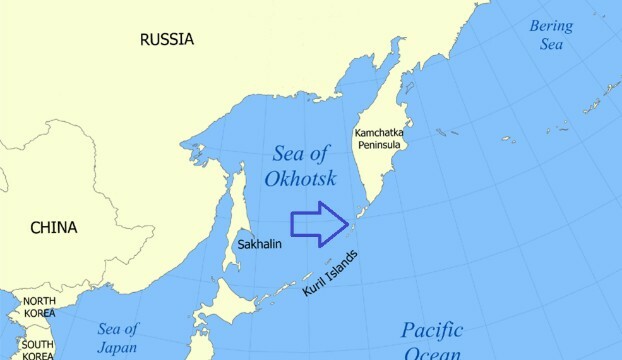 The boat journey took two and a half days, as the team sailed along the convergence of the Pacific Ocean, which is fairly warm, and the Sea of Okhotsk, which is comparatively frigid. This makes for highly tumultuous sailing conditions. Upon arrival, the team immediately began trekking toward the Krenitsyn peak. They had endeavored to track their path in advance, but technological limitations and the lack of a local population and infrastructure have resulted in outdated maps that fail to reflect the true terrain. “I consider Google Maps and Google Earth to be great initiatives, but in many cases they fail to convey what an actual terrain will look like. There can be a huge gap between the picture on the map, and what’s really going on in a given place,” said Kazak. They learned this the hard way; their journey was replete with rough terrain, from slopes to vast swathes of land blanketed in impenetrable shrubbery. In addition to the difficulty of navigating their way through the poorly mapped and entirely unkempt island, they were unsure of what exactly might be waiting for them along the way. While it is known that foxes inhabit the island, the lack of recent human exploration shrouds the island in a certain degree of mystery. That said, Sabitov noted laughingly that the biggest disappointment of the trip was the fact that the team never managed to encounter a bear. One aspect of the journey that proved surprisingly useful were the military access roads formerly used by Soviet and then Russian troops, who maintained a presence on the island from about 1945 to 2005. Though out of use in recent years, these roads helped the team circumvent the some of the island’s more unforgiving flora – a factor that was particularly important considering the frequent rainstorms and heavy fogs the team persevered through. After three days of trekking, the team made it to the top of the Tao-Rusyr Caldera. “It was only by chance that we realized that we were on the top of Toa-Rusyr Caldera. The team was tired after a long, strenuous trek, and we decided to set up a camp. Once we put down our heavy backpacks, [Sabitov] and I decided to take a look around. We climbed some 50 meters from the camp and found the edge of the caldera and excellent view of Krenytsin. The bad weather subsided for long enough to allow us to take some great pictures. Our group was lucky; we had good visibility of the volcano for about four hours,” said Cheremisin. Upon setting up camp, Kazak and Sabitov began to wander along the edge of the caldera, searching for a way to reach the bottom, from where they had hoped to raft to the Krenytsin peak, collecting water samples as they went. Sadly, upon further investigation they found the practically vertical faces of the cliffs below to be deeply foreboding. To which Sabitov shot back: “And you never would have come back,” as both men laughed. After a night spent camping on the edge of the caldera, the team packed their bags and began the long journey back to the shore. While they were trekking, the boat was anchored in the bay of a nearby island, where the captain explained he would wait for them in relatively mild sea conditions. Their only connection to the boat was via a satellite phone. Understandably, this put some of the researchers ill at ease. For Kazak, one of the highlights of the trip was finding the boat waiting for them in the harbor upon their arrival back to the shore. “The best part for me was when we made our way back to the shore and saw the boat waiting for us. It helped that the weather was nice at the time too,” he said. That wouldn’t last long. During their return journey, the boat’s engine broke, leaving the group stranded at sea for about a day amid relentlessly heavy winds. 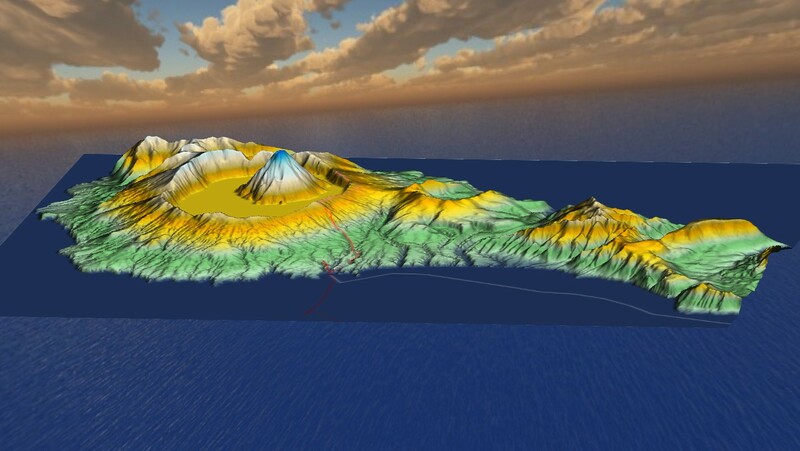 Upon finally making it back to Skoltech, the team came armed with a wealth of new data to supplement their elevation models with, and big plans for what they hope to be their next expedition to the island. Next time, the men plan to bring along some drones, which could prove invaluable in helping to navigate rough or unfamiliar terrain. Noting that the unpredictability of the weather was a key difficulty during the trek, Kazak also expressed hope that next time they’ll be able to do a public service by installing a weather station on the island. “I regret that we didn’t leave a remote weather station last time. That’s something that I hope to do next time, perhaps using crowdfunding,” he said, noting that the nearest weather station is some 100 kilometers away. With drones and a weather station in tow, the troop hopes to head back to Onekotan in due course, and to continue blazing trails and exploring the unexplored.